The non-profit Cow Harbor Warriors was established earlier this year, and they are presently celebrating the first Warrior Weekend here in Northport. Among the events was a four mile run held this morning. As with all the events, it raises a lot of money for the Wounded Warrior Project. Unlike all the other events, it shuts down certain roads for a short period - including the only route into and out of my neighborhood. But because it's for charity, it's justified on balance (not unlike the pizza-eating contest that celebrates gluttony in a country supposedly saddled with an increasingly obese population). This is the first of two straight Saturday mornings where access to and from Crab Meadow is temporarily secured; it will be again for next week's Great Cow Harbor 10K. Since I was up at the time, I took a walk down to check out the race. The runners were led out by motorcycles adorned by American flags, and came through in two clear waves - the runners, followed by the walkers. This puzzled me. I thought it was the Warrior "Run!" Pick up the pace, people! This made me concerned that the roads would not open up by 9:30, as the Town of Huntington had promised. I didn't have anywhere to go, but I felt the disruption should be minimized. 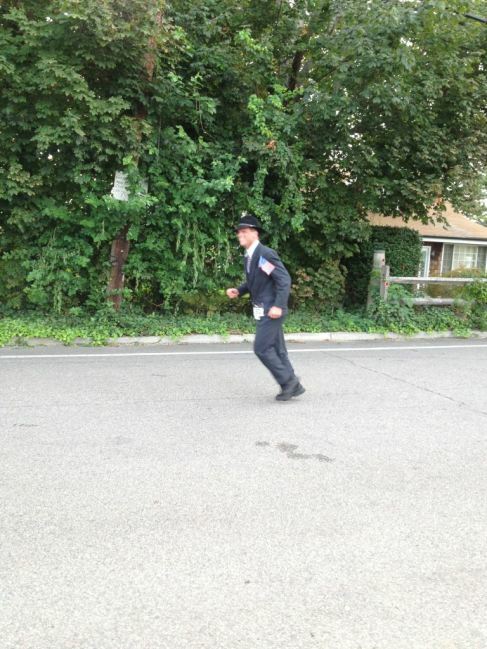 As it turned out, the course stewards did start ushering stragglers to the sidewalk at 9:30. Excellent job by them. I also didn't understand why a couple of runners insisted on using the sidewalk. Why not use the roads when they've been shut down just for you? Last note from the race - just before I walked back up to my house, I was looking toward the runners coming back towards the finish, when in my left ear, I hear "keep it up, finish strong!" I turn my head to see a child of approximately ten, who I presume had just finished the run himself and was walking back to his parents. I kept my mouth shut, but thought that if I was running, I'd have to fight back the urge to give him a piece of my mind. My initial reaction to hearing that and seeing that it was coming from a little boy was outright defensiveness; I thought he was subtly bragging that he had completed the distance in less time. (WARNING: possibly unpopular opinion ahead) I congratulate all 537 finishers and commend the Cow Harbor Warriors for raising so much money for such a worthy cause. But I wonder how many of those finishers will support our troops in the best possible way, at least to me - by calling and writing their Senators and Congressmen and urging their elected representatives to bring our armed forces home. Creating fewer wounded warriors seems just as important as taking care of the ones we already have.